Back in the 1960s, if you were looking for an American-made motorcycle, the choice was easy. Harley-Davidson was the only U.S. motorcycle manufacturer and if you wanted to be "King of the Highway," then your next stop was your local H-D dealer. For the first half of the decade, Harley's top of the line model was the FLH Duo-Glide. This machine had all the "bells and whistles," plus the largest most powerful engine in the H-D lineup. Fully loaded with a windshield, hard luggage and both front/rear suspension, the Duo-Glide was the first true touring model to roll out of Milwaukee. The last year for this model was 1964, so I'll be reviewing what is arguably the "peak" of Duo-Glide development. Classic looks and modern reliability. Harley-Davidson has had a long and storied history since it was founded in 1903 by William Harley, Arthur Davidson and Walter Davidson. Back in those days, Harley-Davidson was just one of dozens of U.S. motorcycle manufacturers, all trying to capitalize on this new form of transportation. 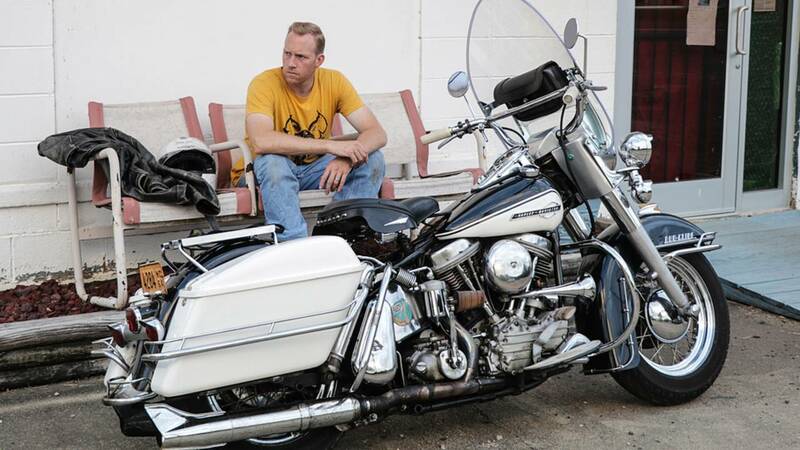 Through innovation and a bit of luck, Harley-Davidson went from three guys building motorcycles in a shed to one of the top three motorcycle manufactures in just over a decade. During that time the sport of motorcycle racing was also skyrocketing in popularity and Harley's success on the track helped increase sales on the showroom floor as they fought it out with their main rivals Excelsior and Indian. Harleys were also known for the toughness and reliability allowing H-D to secure both military and police contracts, which by 1920 made them the top motorcycle manufacturer in the United States. 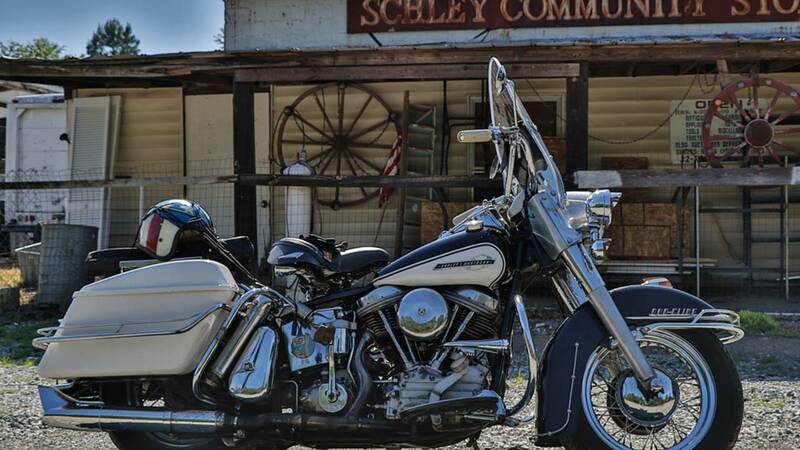 After surviving the Great Depression, Harley found itself as one of only two motorcycle manufacturers left in the United States, with the second being their longtime rival Indian. When WWII broke out in 1939, Harley-Davidson became the main supplier of military motorcycles for the United States and its allies, producing tens of thousands of machines. This left Harley-Davidson in great financial footing by the end of the war and as the American GIs came home, H-D was once again pumping out civilian machines to fill America's need to ride. 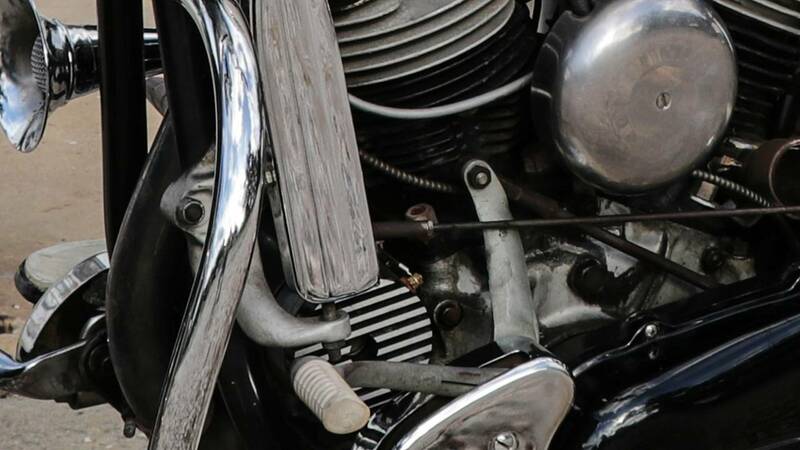 This also meant the end for Indian motorcycles, which slowly declined until going out of business in 1953 – leaving Harley as the sole US motorcycle manufacturer. 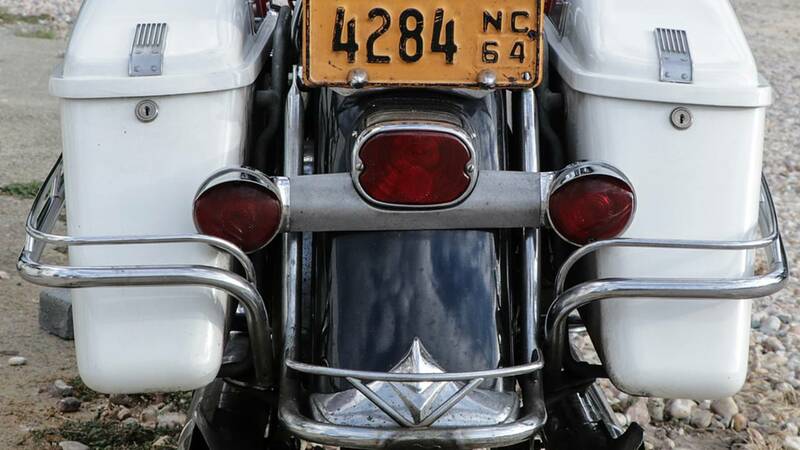 Throughout the 50s and 60s, Harley's main competition came from overseas. First came "middleweight" machines from British manufacturers like Triumph and Norton, followed by the Japanese "lightweights" from Honda and Suzuki. 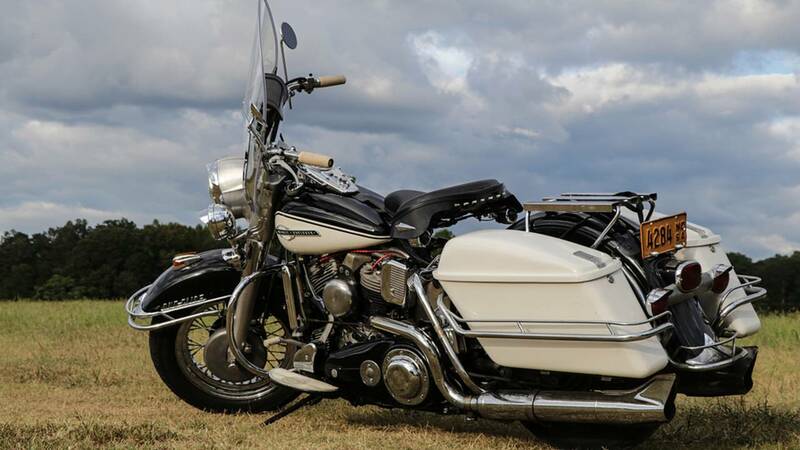 While Harley struggled to compete in these new market segments, it continued to produce "heavyweight" machines that remained popular with the club and touring market. Even with its hands full trying to stem the tide of imported machines, Harley's engineers continued improving its heavyweight machines with upgrades like rear suspension, 12-volt electronics and foot-shifted transmissions, producing reliable motorcycles ready to eat up the miles of highway that crisscrossed the United States. 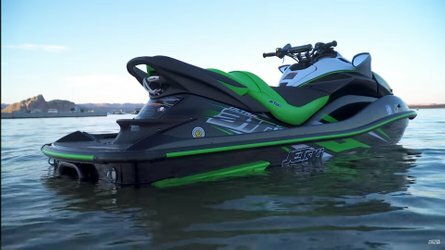 The Duo-Glide is powered by a 1200cc overhead valve engine, nicknamed the "panhead" due to the pan shaped valve covers it uses. This was only the second overhead valve big twin to come out of Milwaukee, the first being the infamous "knucklehead" which now brings top dollar at auction and private sales. 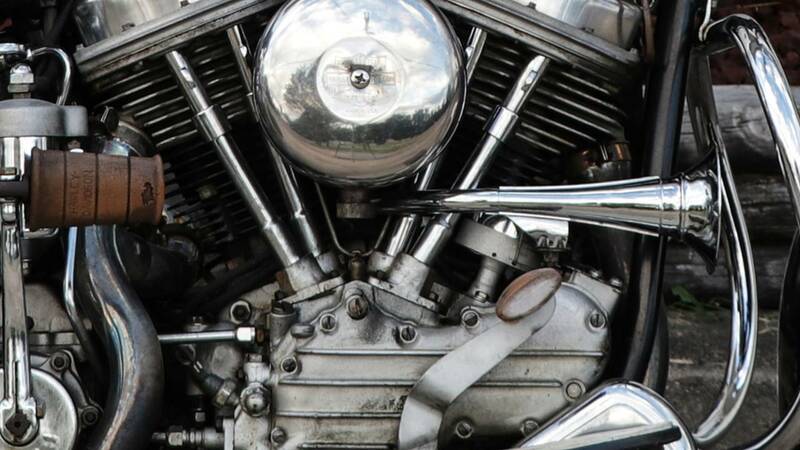 The twin cylinder engine uses Harley's standard 45 degree "V" cylinder arrangement which produces that "potato, potato" exhaust note that Harley is known for. 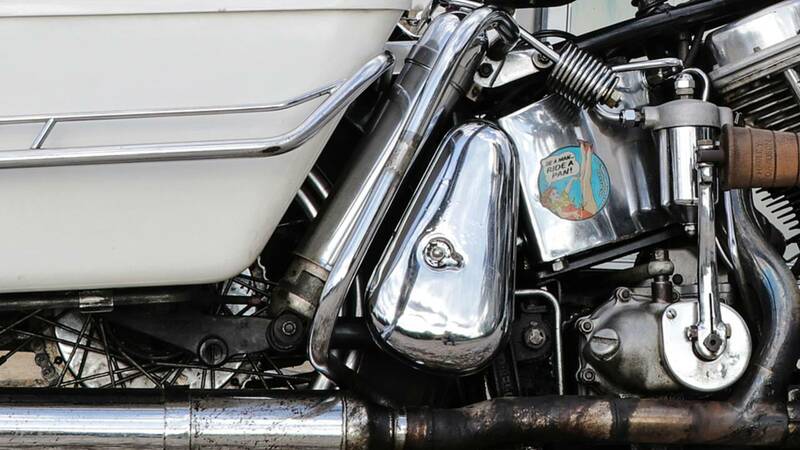 The gas is fed to the motor through a single Linkert butterfly style carburetor and the exhaust exits the motor through dual fishtail mufflers. 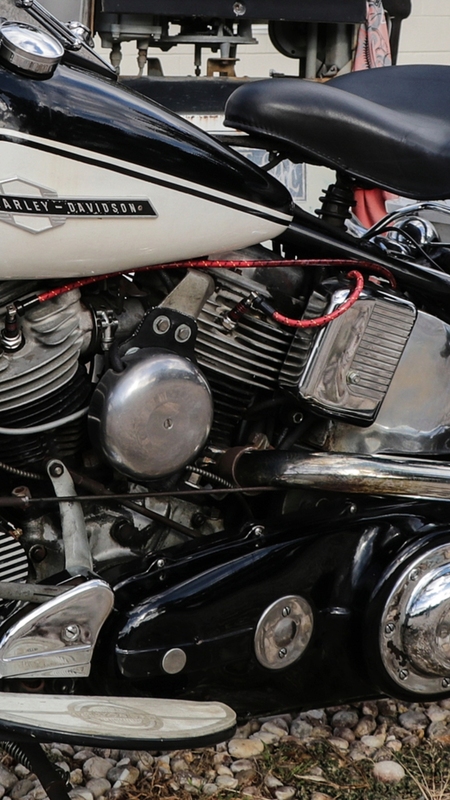 Harley-Davidson produced the Panhead engine from 1948 - 1965. 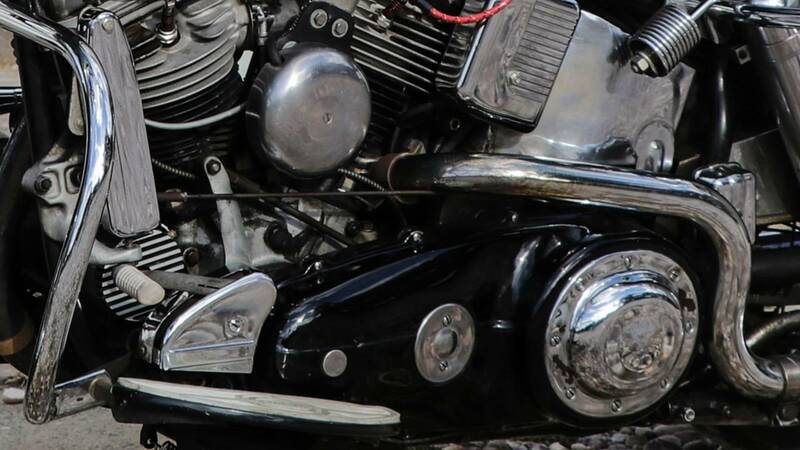 Since the engine's crankshaft is perpendicular to the frame, a chain drive is used to connect the engine to the transmission on the left side of the bike. I should note that on the particular model I tested, this chain drive had been replaced with a belt to provide lower vibration at highway speeds. Power is transferred to the four-speed transmission via a hand-operated dry clutch and a foot shifter allows for the changing of gears. This arrangement is a dramatic departure from the hand shifted designs that Harley-Davidson had used since day one. 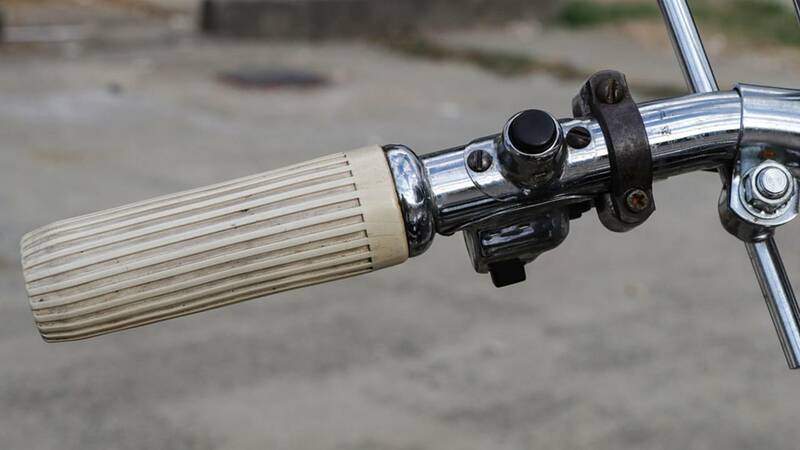 Even though they had experimented with foot shifters in the 1940s, the standard configuration remained a hand shifter until the 1960s. The obvious advantage to this set-up was that the rider could keep both hands on the handlebars while shifting gears. 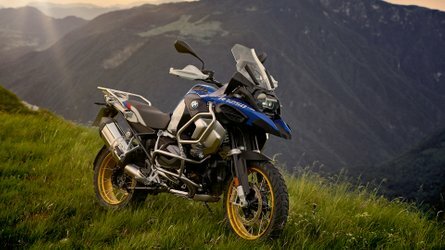 And with the Duo-Glide weighing in at 670 lbs, having both hands on the handlebars is not a bad idea. An enclosed primary transfers power from the engine to the transmission via an upgraded belt drive. A second chain drive connects the transmission to the rear wheel, allowing the Duo-Glide's 55 bhp to hit the street. Like all big twins, the rear chain drive is located on the left-hand side of the motorcycle. 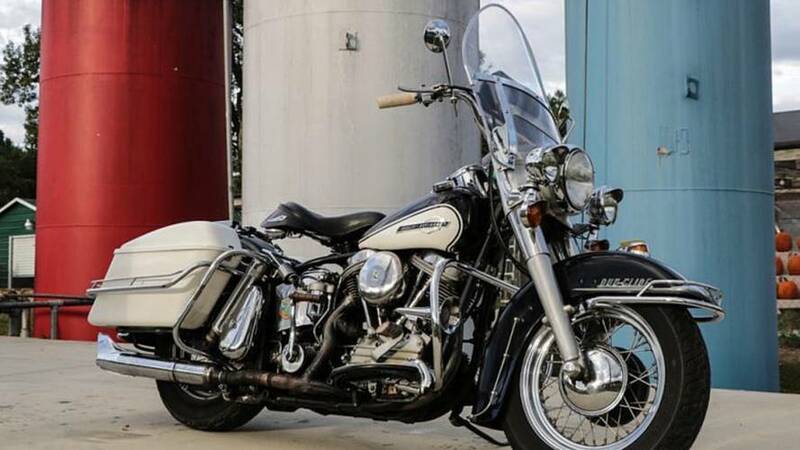 Oddly, Harley-Davidson used right-side drives on all their lower displacement machines, from the 45-cubic-inch flatheads in the 30s and 40s, right on through to the Sportster line still produced today. Dual fishtail mufflers provide a pleasant sounding exhaust note without being obnoxiously loud. 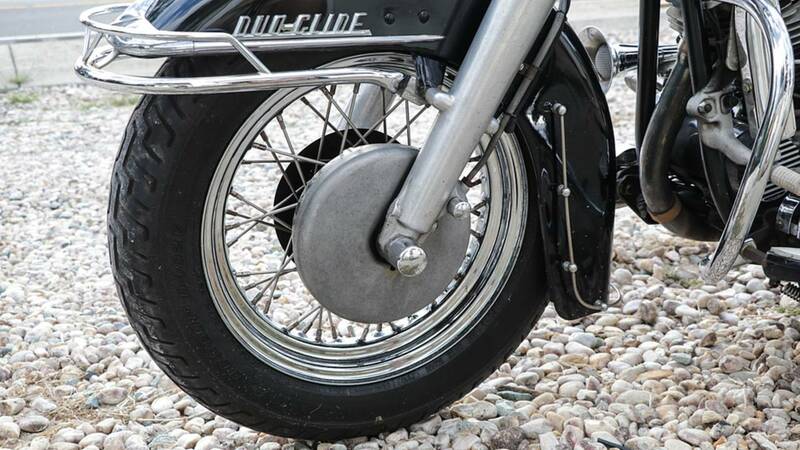 Braking on the Duo-Glide is your standard 1960s drum brake design. There is a single cam cable operated drum brake on the front wheel which does a reasonable job of holding the motorcycle still at stoplights and a much more capable hydraulic drum brake on the rear. The Duo-Glide line were the first big twins to use a hydraulic brake, not just for the improved braking, but also to solve the problem of a flexible brake line for the suspended rear end. All previous big twins used "hard tail" frames, so a solid brake rod was used to operate the rear brake since their was no suspension travel to account for. You may have guessed that the Duo-Glide name refers to this model having both front and rear suspension. The previous model with only front suspension was called the Hydra-Glide, so Harley stuck with this naming convention when they added the rear shocks in 1958. The front suspension consists of aluminum telescopic forks, topped with a cast aluminum nacelle which encases the front headlight. Beside the addition of the headlight nacelle, the design of the front suspension was not changed from its introduction in 1949. The rear suspension uses a pair of chrome-covered shock absorbers to provide a much smoother ride than the previous hardtail models. Tucked between the rear saddlebag and the toolbox, the chrome rear shock is easy to miss. A holdover from the hardtail era is the sprung seat. Unlike your standard motorcycle in which the seat is mounted to the frame, the Duo-Glide's seat is mounted on a spring loaded pogo that fits inside the rear down tube of the frame. When riding with a passenger or if you need additional support, there are also external springs which connect under the seat to provide a firmer ride. 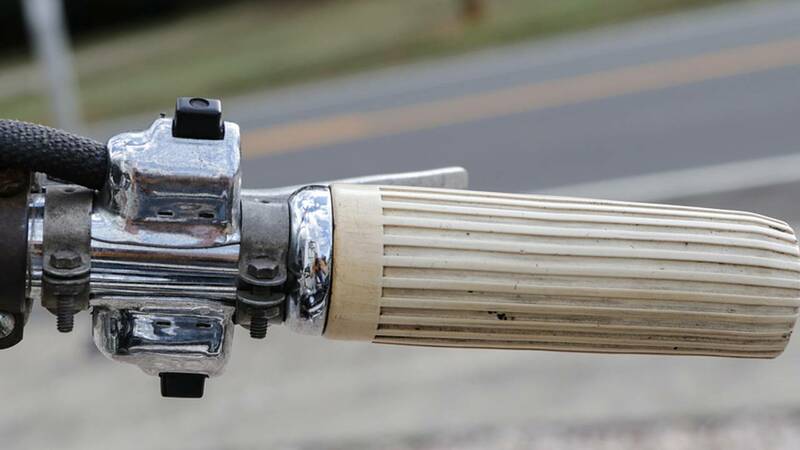 The chrome spring located just under the frame rail is referred to as a "buddy spring" and its bracket can be attached to the rear of the seat for more support. The Duo-Glide rides on fat 5-inch by 16-inch tubed tires, mounted to chrome plated steel drop center spoked rims front and rear. For the most part, the Duo-Glide controls are just like any standard motorcycle with a few minor additions. The foot shifter is located on the left hand side of the bike with a handlebar mounted clutch lever also on the left. To ease the operation of the clutch, a spring assist (nicknamed the mousetrap due to its ability to snap your finger if adjusted incorrectly) is mounted on the left front downtube. A chrome cover hides the large spring used to assist in clutch operation. Braking is handled with a right handlebar mounted lever for the front brake and a right mounted foot pedal for the rear. What you will note right away is that both hand grips are moveable. While the right-side grip controls the throttle, the left hand controls the engine timing. 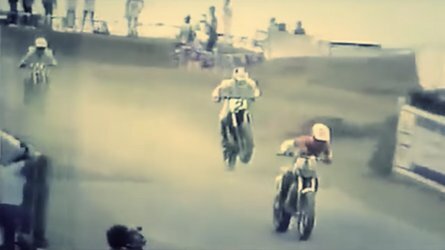 In practice, you retard the timing to start the motorcycle and then advance the timing once the motorcycle is running. During normal operation, further adjustments to the timing are unnecessary, so once the motorcycle is running you seldom – if ever – need to make any changes. Rotating the left hand grip allows the rider to advance or retard the engine timing. The button operates the horn and the switch controls the hi/low beam. The Duo-Glide I tested was equipped with the full complement of lights, so there are handlebar switches to control the hi/low beam, turn signals and the spot lights. 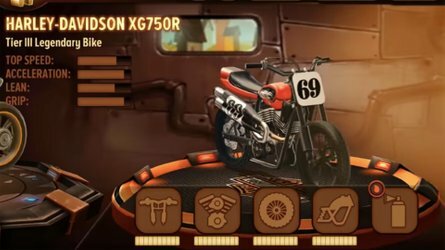 As you would expect, the horn button is also mounted to the handlebars, but since this motorcycle is kickstart only, that magic electronic start button is absent. The spotlights are controlled by the top switch and the lower switch controls the turn signals. Centrally mounted between the fuel tanks is a dash which houses the speedometer, indicator lights (neutral, oil, and generator) and the ignition switch. A large speedometer is the main feature of the dash, along with a lockable ignition switch. Two green indicator lights are mounted on the rear of the headlight nacelle which indicate which turn signal is on. The first hurdle to getting this motorcycle on the road is starting the engine. 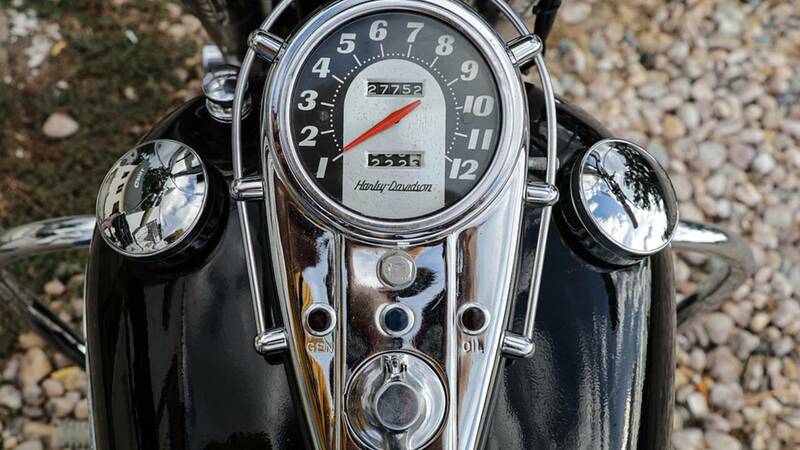 Keep in mind that the "H" in the "FLH" model designation stands for "High Compression" and that means this motorcycle really takes a strong leg to get it started. 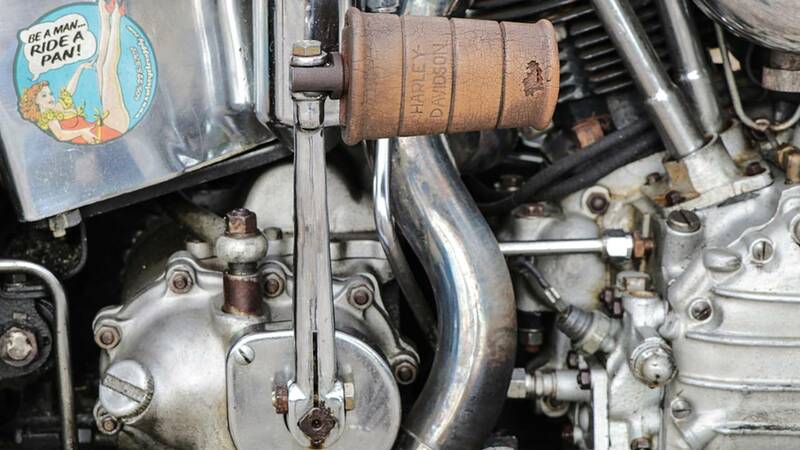 For an antique Harley, the engine noise is moderate, thanks to hydraulic lifters and an enclosed valve train. In fact, if you are used to old flatheads, it seems whisper quiet. 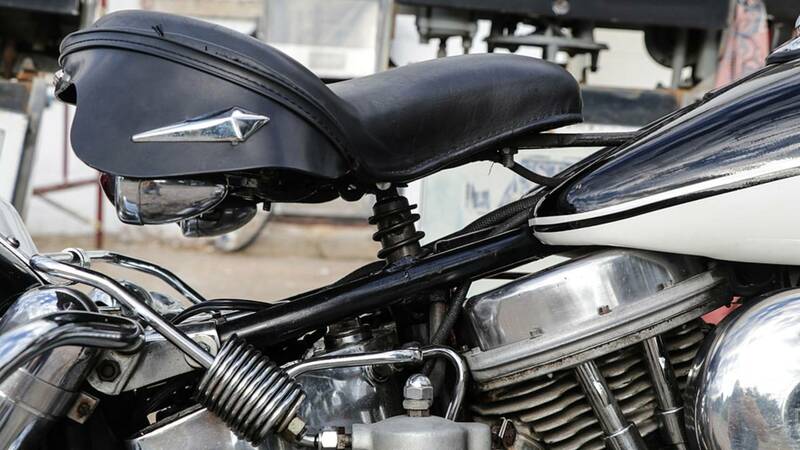 If you follow the correct procedure, kickstarting a panhead is a breeze. If you don't, be prepared for a good leg workout. I found the sprung solo seat to be very comfortable and although it looks high when shown without a rider, it actually sinks down once you put your full weight on it. It does take some getting used to as there is sometimes a slight delay between when the suspension compresses and when the seat pogo compresses. The floorboards are a nice touch and provide plenty of foot support while allowing enough room to change your leg position without having to remove your feet from the boards. A contoured seat and wide floorboards make for a comfortable sitting position. At low speeds the Duo-Glide can be a bit of handful since the front end is fairly heavy compared to most street bikes. Between that big front tire, full fender, cast aluminum nacelle and windshield, there is really a lot of weight up front. It does have crash guards both front and rear, which may point to the fact that Harley expected there to be a few parking lot drops from time to time. You definitely do not want to find yourself pushing this motorcycle up any inclines, so that is something to always be thinking about when choosing parking. A heavy front end provides great stability on the highway, but is harder to manage at low speeds. Where the Duo-Glide really shines is on the highway. Wide tires and 670 lbs make for a solid feel while cruising down the road and you don't have to worry about passing 18 wheelers buffeting you around. The windshield is tall enough that you look through it rather than over and it provides plenty of protection from wind and debris. It cruises comfortably at around 65 mph, so it can handle modern highway speeds although be prepared for more vibration as your speed increases. The peaked windshield is tall enough to block most road debris. It is definitely a little more challenging to ride in the twisties when its weight starts to become a disadvantage. Also, if you press it too hard into the curves there are a number of metal parts that make contact with the road and while the sparks they provide may look good to bystanders, it can be a little disconcerting for the rider. This is nothing an experienced rider cannot handle, but I would caution new riders to take it easy in the turns. Low slung mufflers are ready to grind the road in tight turns. 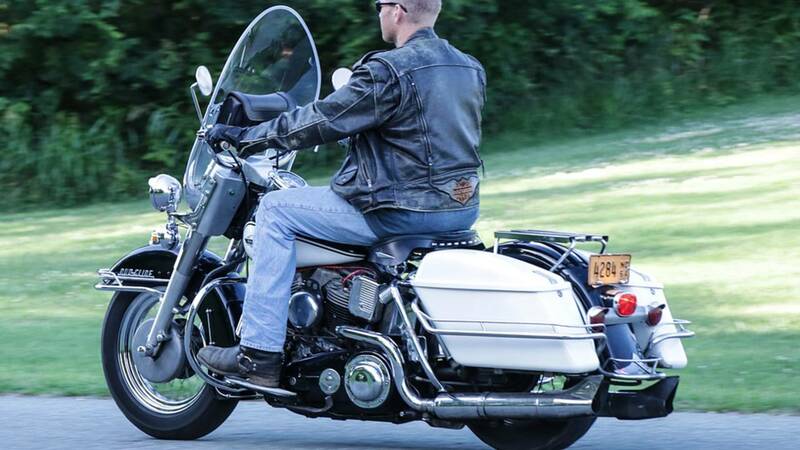 Like all Harley big-twins the engine has that "stump-pulling" torque down low, but I would categorize its acceleration as more deliberate than quick. The four-speed transmission means there is a lot less shifting than with a newer machines (Who needs six-speed transmissions?) 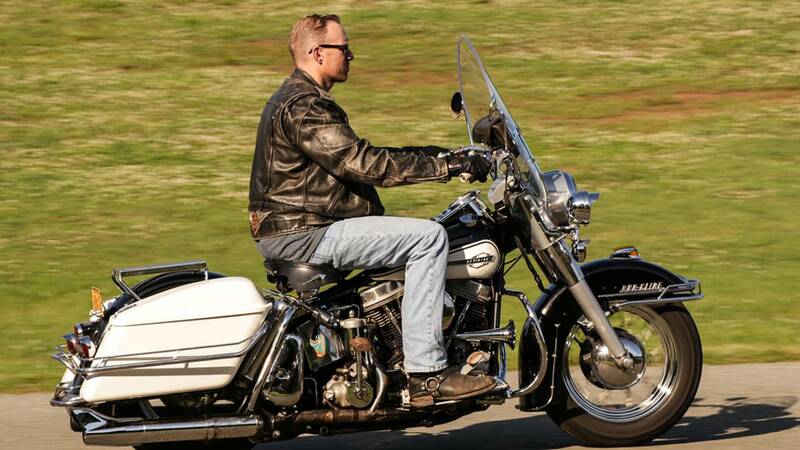 and there is something about winding the gears out on an old Harley that just puts a smile on your face. I often compare it to driving a 60s muscle car, which, while slower than most modern sports cars, just feels more powerful. 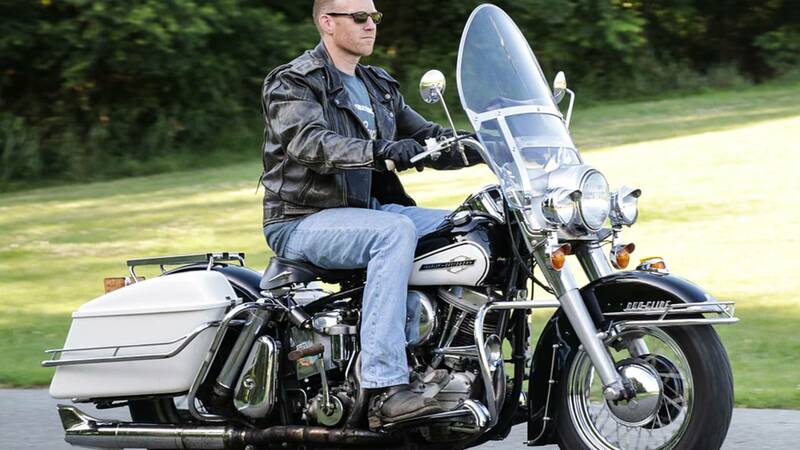 There is nothing like rolling on the throttle of a Harley-Davidson Big Twin. Overall, one of the best qualities of the Duo-Glide is it straddles the line between antique and modern motorcycles. If you've never been on an antique machine, the Duo-Glide is not going to be completely alien and besides having to the manually advanced the timing, the rest of the operations are the same as a modern motorcycle. The bonus is you get those classic Harley lines in a machine that you can actually ride on a regular basis. At home on a country road or a four-lane highway. 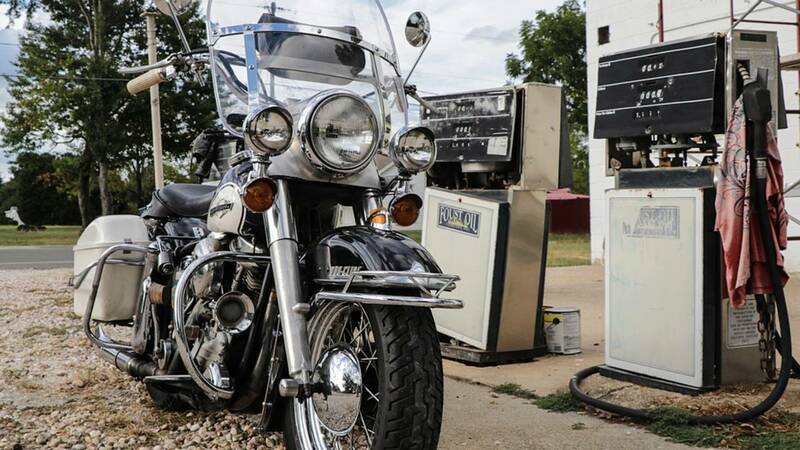 The Duo-Glide was built for touring and even though it has seen over 50 years on the road it is still ready to roll out on that next great ride. An optional top box is available for the rear rack and when combined with the two saddlebags makes for plenty of room for storing a week's worth of gear. 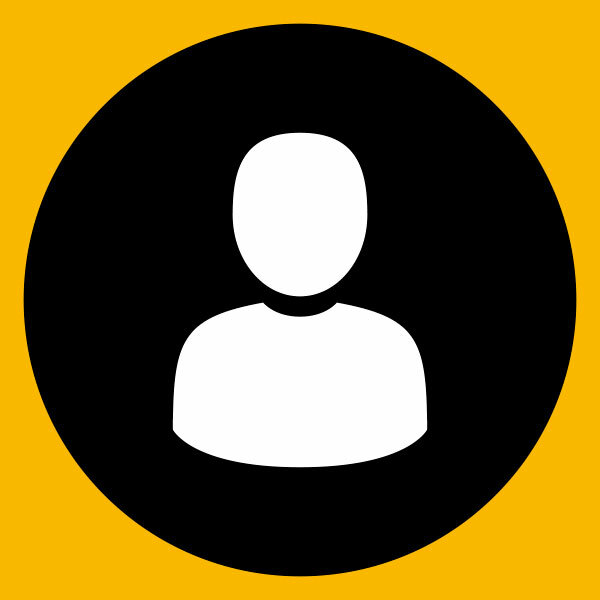 Make sure you save space for a few tools just in case, as you never know when you might need to make an "adjustment." While that may sound like an added inconvenience, being able to fix this machine with just common hand tools is actually what I would consider a bonus. How many modern bikes can you fix with just a set of wrenches, without the aid of a computer diagnostics? Just throw some clothes in the saddlebags and you're ready for your next adventure.